A word from the photographer: At Erin & Doug’s wedding, the weather forecast was threatening rain, which put the ceremony inside. It didn’t rain after all, so they were still able to have cocktails and make portraits outside. Still, it was cool to see that even though their plan was to have the ceremony outside, bringing it indoors was perfect. The light coming in through the window in the loft at Gedney Farm looked amazing. And there was a double rainbow, which was magical and a blessing. It just felt like it was meant to be. Plus, it was my first wedding rainbow, so I was totally pumped. 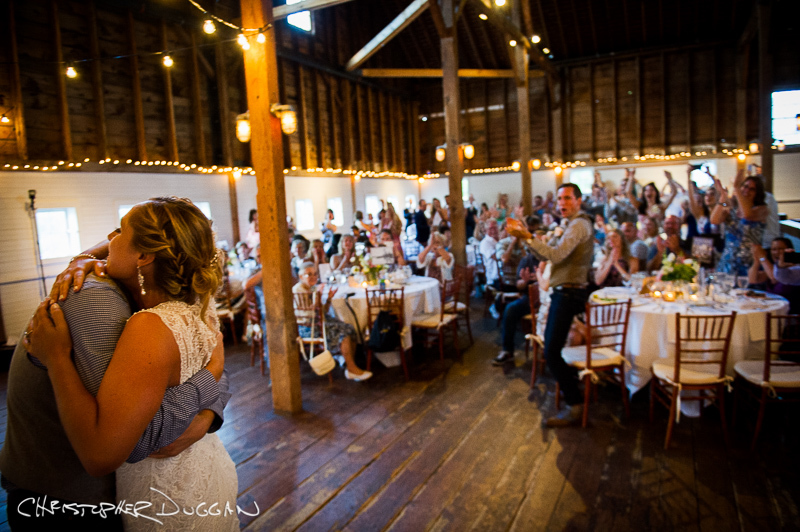 Erin looked beautiful in her Nicole Miller wedding dress, and I loved the guys in their jeans. It felt like it matched the space, and they all looked awesome.